If you are following our site lately, you would know we have started covering sample ISTQB questions in our earlier post. Here is a second post to help you better prepare for ISTQB foundation level examination. Best way to prepare is to answer all exercises without looking at the answer. You can find the answers at the end of the exercise. 1. Given the following state transition table Which of the test cases below will cover the following series of state transitions? S1 SO S1 S2 SO. A. D, A, B, C.
2. Which of the following best describes the difference between an inspection and a walkthrough? 3. From a testing perspective, what are the main purposes of Configuration Management? 4. As part of which test process do you determine the exit criteria? 5. Who would usually perform debugging activities? 6. What is the main objective when reviewing a software deliverable? 7. 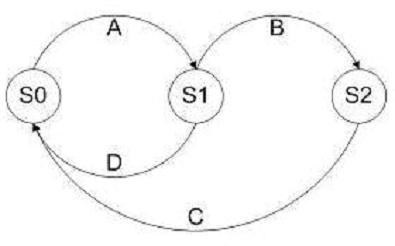 Given the following state transition diagram Which of the following series of state transitions contains an invalid transition which may indicate a fault in the system design? 8. Which of the following would you not usually find on a software incident report? 9. Which of the following are characteristic of regression testing? 10. A wholesaler sells printer cartridges. The minimum order quantity is 5. There is a 20% discount for orders of 100 or more printer cartridges. You have been asked to prepare test cases using various values for the number of printer cartridges ordered. Which of the following groups contain three test inputs that would be generated using Boundary Value Analysis? 12. Which activity in the fundamental test process creates test suites for efficient test execution? 13. Which of the following is not part of a high level test plan? 14. Which tool will be used to test the flag memory leaks and unassigned pointers? 16. Which of the following is not a characteristic for Testability? 20. Which of the following is the component test standard? 21. Which of the following is a type of non-functional testing? 22. A piece of software has been given. What tests in the Following will you perform? A. 1 & 2 are true and 3 is false. B. 1, 2 & 3 are true. C. 1 is true, 2 & 3 are false. 24. In a system designed to work out the tax to be paid: An employee has $4000 of salary tax free. The next $1500 is taxed at 10% The next $28000 is taxed at 22% Any further amount is taxed at 40%. Which of these groups of numbers would fall into the same equivalence class? Stay tuned for our next articles about ISTQB questions.